OK – this post is going to read like a plug for the insurance industry, or at least for insurance agents and brokers. And maybe it is, but rest assured the endorsement is based on life experience and not on any an affinity that I have for the profession or any single member engaged in it. Nor am I in any way involved in the insurance industry myself. But experience has taught me that an independent insurance agent is your best friend when buying insurance of nearly any type. Do you know how complicated and difficult your job and industry have become? That’s true of virtually every job and every industry that exists today. What used to be simple has become complex, and what used to be complex is now impossible to decipher. So it is with the insurance industry. Insurance has always had its own unique complications, like everything else in the economy, but insurance is more tangled than ever. Just look at what Obamacare has done with health insurance. Does anyone really know what kind of health insurance they’re even signing up for any more? Everyone says “go to the exchanges”, but that’s a journey best not taken alone. I’m not even sure to what degree insurance agents involve themselves with the exchanges – and I’m open to any broker or agent who’d like to write an article on this site explaining how that’s working right now. But at a minimum, I think it behooves us all to at least get coaching from a reputable insurance agent before even venturing onto the exchanges. I have a feeling that in the Obamacare world, health insurance is going to get a lot more like the federal income tax code – progressively more complicated, filled with loopholes, and subject to periodic attempts at simplification (that will always fail). In that environment, an insurance agent might soon become something like CPA, except they will exist primarily to navigate us through the health insurance system. One of the biggest misconceptions when it comes to insurance agents and brokers is that you will pay more for your coverage by using one. Generally speaking, this is not true at all. The insurance company will charge you the same premium to complete an application directly with them that they will if a broker handles the application for you. Much like a real estate agent, insurance agents will be paid a certain agreed-upon percentage of the premium as a commission for bringing you to the insurance company as a customer. There will be no additional payment required from you – which means you have nothing to lose by using an agent. Getting back to that complication thing, since insurance agents work in the industry, they have far more knowledge of what’s really going on than we can ever have. Most of us seriously overrate our ability to comprehend the insurance universe. It’s only when a DIY policy that we have arranged ourselves goes in the wrong direction that we realize that we probably should’ve gotten some help before accepting the policy. In point in fact, insurance policies are often riddled with exclusions and conditions. As insurance lay people, we often think that “we’re covered” by virtue of the fact that we have a policy in place. But nothing could be farther from the truth! Home owners insurance is just one example, but a very good one at that. If you have a standard homeowners insurance policy, and your house is hit by a flood or earthquake your policy will not cover the damage you will sustain as a result of the disaster. In order to get coverage you have to have a specific policy for either flood or earthquake insurance. There are many such examples in the insurance world, and most of us don’t find that out until it’s too late. One of the biggest advantages to working with an independent insurance agent is the fact that they are typically connected with a number of insurance companies. This enables them to find you the type of coverage that you need at the most affordable price. Life insurance is an excellent example in this case. Let’s say that you have had a major health episode in the past, like cancer. You may find that the first two or three companies that you apply to for life insurance deny your application. As a result, you may assume that you are completely uninsurable. If you contact a life insurance agent, who works with dozens of insurance companies, he or she may be able to place you with companies that do accept people with a history of cancer. And since there’ll be several companies that do, they’ll help you to get the most affordable policy possible. It is unlikely that you’d be able to do on your own. This is an excellent time to bring up a major caveat on the topic of insurance agents and brokers. I’m stressing the use of independent insurance agents here, the kind who represent multiple insurance companies. This article does not apply to insurance agents who are employed to represent a single insurance company. The single company “agent” is actually a rep for that company, and will claim that that company is the answer to your insurance needs, what ever they may be. He’ll sell you on that company because that’s what he’s required to do – whether it’s actually the best policy for you won’t even matter. Moral of the story: make sure that an agent who bills him/herself as “independent” really is independent. Not only are entire industries becoming more complicated, but so is the paperwork that they require. This is increasingly true when it comes to insurance (though ironically, now that health insurance companies can no longer exclude or rate you for previous conditions, those applications have apparently gotten easier – but give it time). One thing I learned in the mortgage business is that how you fill out those applications means virtually everything. Though your omissions and exaggerations might get you the loan initially, you could be in big trouble if something goes wrong and you default on the loan within the first two or three years of closing. That’s when the misinformation you provided on your application can come back and bite you where the sun doesn’t shine. A lender can use your written fibs as the basis of fraud allegations and come after you for financial damages. And so it is with insurance as well. Misstatements can be used as a basis of insurance fraud in the event that you make an early claim after taking your policy. The insurance company can refuse to pay your claim, drop your coverage, and in extreme cases they can even consider prosecution. That’s something that can happen if you’re in a hurry when you’re completing the paperwork, and don’t give serious consideration to your answers. That’s why having an insurance agent filling out the paperwork can provide a much needed layer of protection. It’s a matter of having a second pair of eyes on the paperwork, and a trained pair at that. 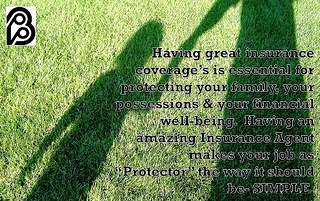 Very few people have insurance policies for life anymore. Sooner or later, your insurance company will move out of your area or even dropped a coverage type entirely. More typically however it’s likely that your premiums will be increased to the point that you can no longer afford the policy. If any of those events takes place, you’ll be out shopping for another policy. I don’t know about you, but shopping for insurance is not one of the most pleasant experiences. You have to educate yourself about a lot of things that you normally don’t concern yourself with, contact multiple insurance companies for quotes, then fill out the mountains paperwork. But if you get your insurance policy through an independent agent, the agent will be in a position to roll your coverage over to another company when the previous company is no longer effective. Once again, he or she will be able to direct you to the companies that are most sympathetic to your particular situation, and at the best possible price. As rule, I like the whole DIY concept, and use it often myself. But there are times when you have to acknowledge that you are in over your head, and it’s time to get professional help. When it comes to insurance, that means getting a competent insurance agent or broker. What are your thoughts on using insurance agents? Do use them, or do you prefer the insurance DIY route? Thanks for sharing this. I’ve been trying to find health insurance I can afford since being laid off from a long term job. The HHS site was a disaster, I cannot find insurance! I will try a agent since reading this. Hi Susann – My contacts in the insurance business are telling me this is a common problem, as well as individuals who have gone to the website looking for coverage. I would at least get some advice from an agent, and maybe even offer to pay him or her a fee to help walk you through it. It’s too easy to make a mistake when you don’t know what you’re doing, and health insurance is not an area where you want to make a mistake. Good luck, and feel free to report back with your experience.